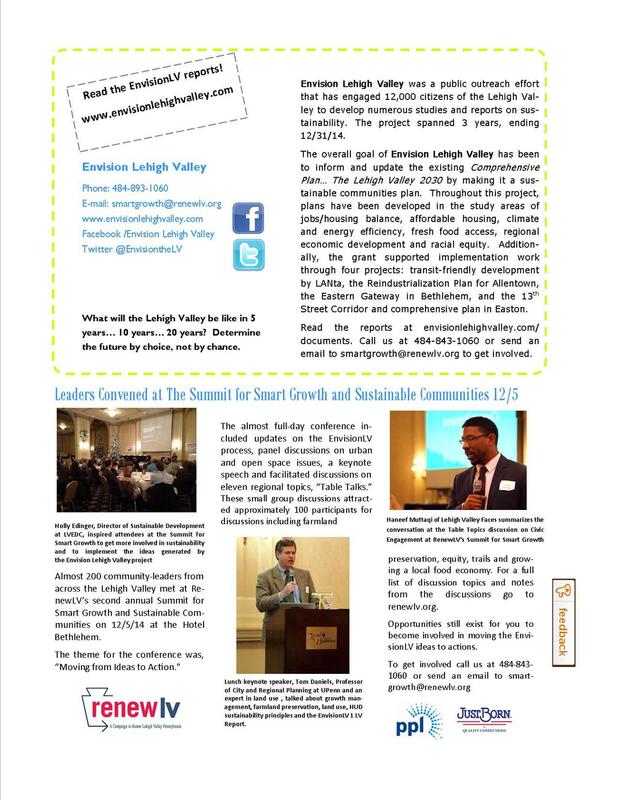 During this holiday season, RenewLV would like to honor you and the many people in the Lehigh Valley who made “sustainable” choices in 2014 – choices that benefited us critically as a region — individually and collectively, economically and environmentally. People who supported our local food economy by shopping at area farmers’ markets or by subscribing to CSA’s (Community Supported Agriculture). One of our EnvisionLV consortium members, Lynn Prior of Buy Fresh — Buy Local of the Greater Lehigh Valley reminds us that if every household spent $10 per week at a local farmers market, it would bring almost $200 million into our regional economy. Keep those local food purchases going! Businesses who invested in our center cities in unprecedented numbers, some purchasing and rehabbing properties, others making decisions to move their offices downtown. It’s great to see so many new businesses in the downtowns! As 2014 and the EnvisionLV process wraps up, at RenewLV, we believe that the best is yet to come. Now is when we continue the drumbeat for “Moving from Ideas to Actions” for smart growth, sustainability and municipal cooperation in 2015 and beyond. In order to continue to engage the public in our important work, we need your help. Please support RenewLV financially with a year-end donation by clicking here for online donations, or send a check to RenewLV at 1337 East Fifth Street, Bethlehem, PA 18015. Thank you for your interest and involvement in our cause. I’m looking forward to continuing to work together with you to be a catalyst for action in 2015! 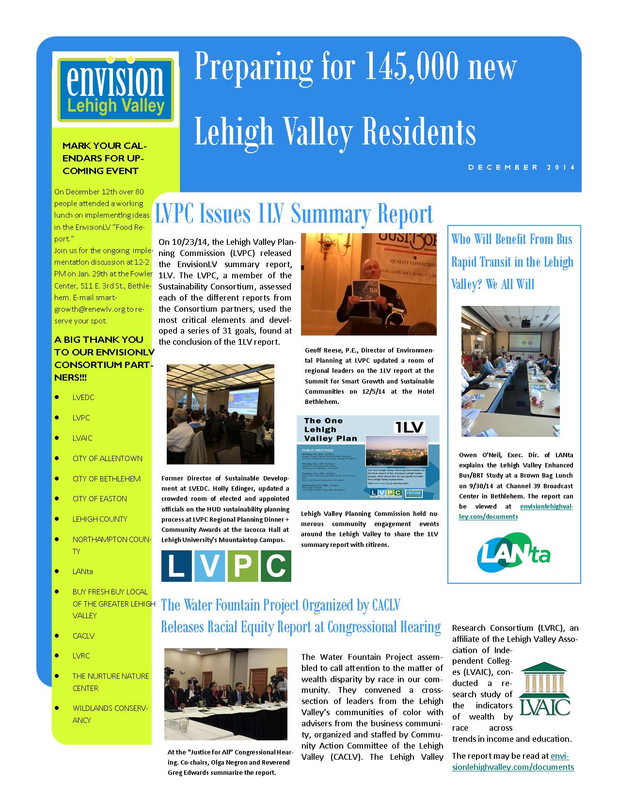 We have been and will continue to post the drafts of the studies as they are completed by the Envision Lehigh Valley consortium partners at envisionlehighvalley.com website under “documents.” If you have not already done so, we highly recommend that you read the reports and supporting documents on the topics of interest to you and consider their recommendations. They include a wealth of information in areas of economic development, fresh food access, transportation, housing and the jobs/housing balance and ideas on how you and organizations with which you are affiliated can join the larger effort to making more sustainable choices. If you want to connect with others who are “Moving Ideas to Actions,” reach out to us at smartgrowth@renewlv.org and we will get you plugged in.